Hair transplantation stands out as a special surgical technique that has shown remarkable progress over the past 15 years. As a natural result of this fast-paced progression, the price of undergoing an operation has sharply reduced. 15 years earlier, the costs of procedures, which was performed under difficult conditions and produced unfavorable results, ranged from 20.000-30.000$, whereas today a procedure of 3,000-4,000 hair grafts (the number of grafts to cover an average degree of baldness) can be performed at price levels less than one-tenth of the former costs. In our article we will be considering hair transplant cost for an operation of 3,000-4-500 grafts, with a surgical time of 6-7 hours. 1. A dermatologist or a physician in the field of medical aesthetics being present during the operation. 2. As the procedure is considered surgical, it requires a well equipped hospital. At least 3 healthcare technicians/assistants have to work full-time on an average to perform a hair-transplant surgery. 4. Surgical supplies: Depending on the operation type; FUE method requires micro motors, petri dishes, punches and other main medical supplies, whereas the DHI technique in addition to these, requires DHI choi pins. 5. Pre-operative and post-operative blood testing as well as medications to be used following the operation. 6. In addition to these, other expenses incurred for potential patients coming from abroad include transportation, hotel and transfer services. The first three factors that are related to personnel and hospital expenditures are the primary costs of an operation accounting for half of the total expenses. However, keep in mind that the cost of an operation performed in a luxurious hospital will require an additional amount to be charged thus, increasing the price of the surgical procedure. The same supply expenses varies between FUE and DHI. FUE is a more cost-effective operation option compared to DHI. The reason lies in the fact that the needles of the implanter pen utilized during a DHI procedure are expensive and have to be disposed after every surgical operation. A crucial point regarding the utilization of medical supplies is the fact that these supplies can only be used for one patient. All relevant medical supplies are utilized for one patient and the punch (FUE needle) as well as the DHI needle cannot be reused. The cost of a Robotic FUE, however will be higher when compared to other techniques. “Unfortunately these robotic devices can only perform by as much as 20% of human labor.” For a robotic FUE or a DHI, in both cases a specialized engineer is required so as to operate the device. 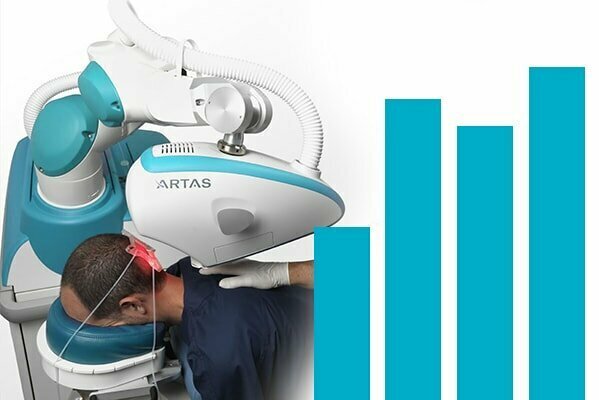 Considering that the robotic device costs hundreds of thousands of dollars, it is simply an unnecessary flaunting act for a clinic to carry out such an investment. While having limited efficacy in the operation, its impact on the expenses may exceed hundreds of thousands of dollars. Apart from this, as you will guess, there will also be expenses associated with accommodation, transfer and adviser services. When considering the inclusion of a luxurios hotel and accommodation, we can speak of a price variation between 40 to 50%. Clinics that attempt to keep the costs low, unfortunately incorporate the probability of serious risks associated with a hair transplant to occur. The operating surgeon and clinical staff stand out as the most crucial elements related to costs. A clinical staff composed of medical officials with inadequate training and insufficient experience may fail to perform a successful procedure and cause irreparable consequences. Regrettably, we as Dr. Serkan Aygin Clinic and a number of clinics also have to perform operations to repair such incidents that has caused severe damage. Be aware towards clinics that are named as ‘clinic’ but only pay attention to cut down expenses by employing staff that work for a pittance. Such clinics where doctors are not at the forefront will tend to be less concerned about the future, thus increasing the likelihood of practising misconduct. If cost remains as an important concern for a person planning to undergo a hair transplant procedure, then certain issues such as, the operating surgeon, the experience of clinical staff, the quality of medical supplies utilized and the condition of being single use should also be taken into account before proceeding. A doctor who has a long-standing reputation for performing successful procedures, will always attach great importance to all the operations he/she has conducted and knows that each patient bears his/her name. Undergoing an operation in a hospital or clinic with qualified doctors having experience in hair transplantation accumulated through many years and that places great importance on every operation performed, is crucial with regards to the outcome of the surgery. If you have any questions or need advice regarding your hair loss condition, you can always contact us.